Devon Wildlife Trust says the strawberry spider was found at Meeth Quarry nature reserve. When was the last time you saw a hedgehog? Hedgehogs are disappearing, with fewer than a million left in the UK. Some familiar faces have practical tips on saving our prickly pals. A fly believed to be extinct for 150 years has been found in Devon. The insect, Rhaphium pectinatum, has been recorded only once in the UK before in 1868. It was discovered alive and well and living on Devon Wildlife Trust’s Old Sludge beds nature reserve, near Exeter. I took a recent trip to Devon Wildlife Trust’s Old Sludge Beds nature reserve on the outskirts of Exeter specifically to look for flies. Imagine my surprise when I examined my catch that evening to find it included a fly that was presumed extinct in Britain, not having been seen for 147 years! Definitely one to add to the list of Devon specialities. Finding the fly here demonstrates the importance of the work the Devon Wildlife Trust does looking after these unusual and special habitats. Some people may think the only good fly is a dead one but they are important they are for food for other creatures, pollination... and recycling waste. A forestry site on Dartmoor is to become a new nature reserve. Bellever Moor and Meadow is owned by the Forestry Commission, but has been leased to the Devon Wildlife Trust to manage alongside its other reserves. It says it wants to turn the 70-hectare site into a wildlife haven. Devon Wildlife Trust is taking High Court action over a council decision to build houses on a site where rare bats breed. Teignbridge District Council approved plans for 230 houses to be built 170 metres from land where greater horseshoe bats congregate to give birth and raise their young. The case is due to be heard at Bristol later today. 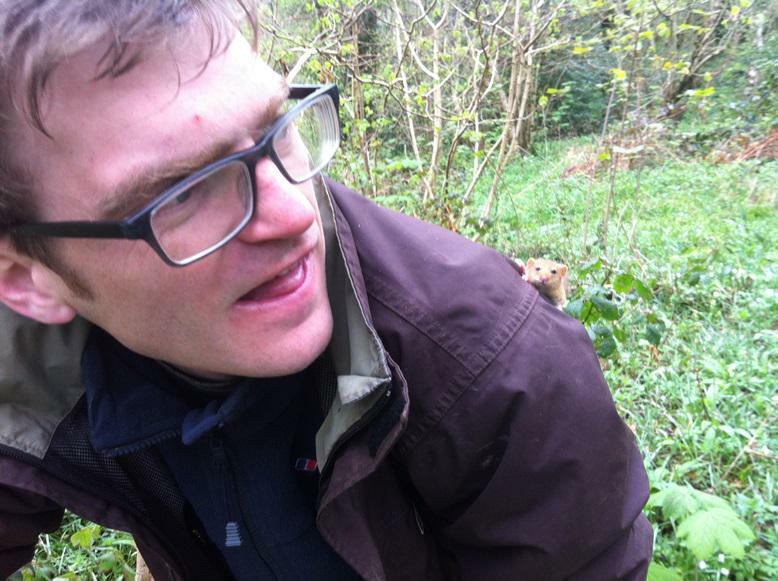 Can you spot this volunteer's new friend?